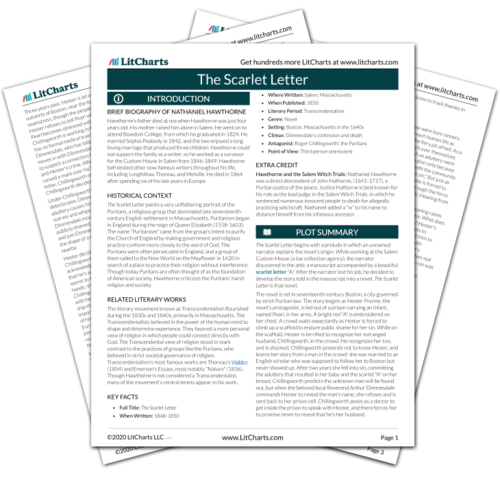 Instant downloads of all 942 LitChart PDFs (including The Scarlet Letter). 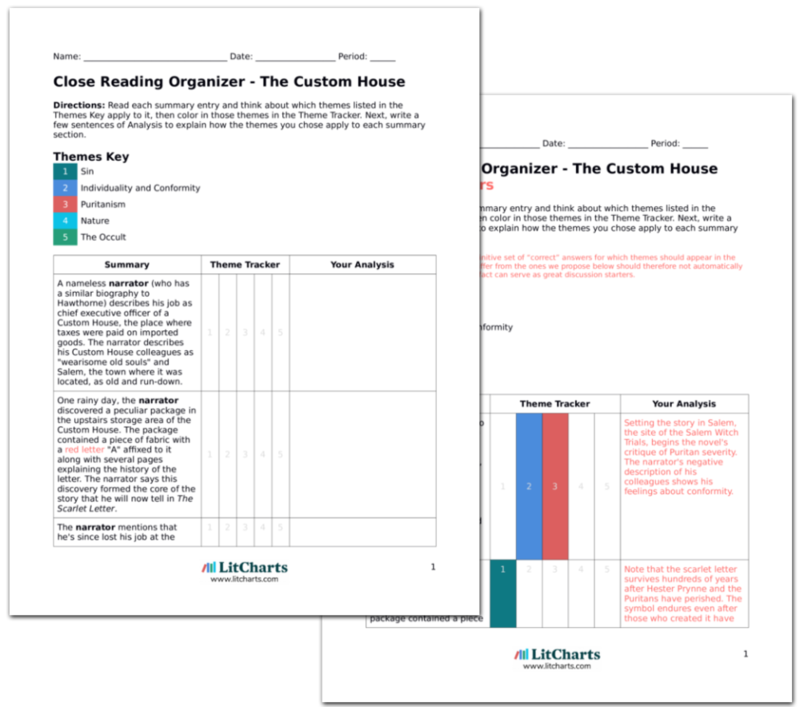 LitCharts assigns a color and icon to each theme in The Scarlet Letter, which you can use to track the themes throughout the work. A crowd of men and women assembles near a dilapidated wooden prison. The narrator remarks that the founders of every new settlement have always sought first to build a prison and a graveyard. He adds that this particular prison was most likely built upon the founding of Boston and describes prisons as the "black flower of civilized society." Prisons are a "black flower" because though they are meant to punish sin (represented by the color black in the novel), they would not exist without sin. Prisons feed on sin in order to grow. Next to the prison door stands a blooming wild rose bush. The narrator imagines that perhaps the rose bush grows in such an unlikely place to offer comfort to prisoners entering the jail and forgiveness from Nature to those leaving it to die on the scaffold. The prison, a "black flower," contrasts with the beautiful rose bush, which grows naturally. The prison punishes, Nature and the rose bush forgive. The narrator describes the rose bush as sitting on the threshold of the story he plans to tell. He then plucks one of the rose blossoms and offers it to the reader. He describes the gesture and the blossom as a symbol of the moral that the reader might learn in reading his "tale of human frailty and sorrow." The Scarlet Letter's moral is that people must accept and forgive their own and other people's worst qualities. To deny those qualities, as the Puritans do, is to deny one's identity. Kestler, Justin. "The Scarlet Letter Chapter 1." LitCharts. LitCharts LLC, 22 Jul 2013. Web. 22 Dec 2018. Kestler, Justin. "The Scarlet Letter Chapter 1." LitCharts LLC, July 22, 2013. Retrieved December 22, 2018. https://www.litcharts.com/lit/the-scarlet-letter/chapter-1.